Atlus has released the first English trailer for Etrian Odyssey Nexus, showcasing the features found in the last Etrian Odyssey title for Nintendo 3DS. Find the trailer below. In case you missed it, you can find a detailed rundown provided by Atlus in the announcement post. Also be sure to check out what's available in the Launch Edition of the game. 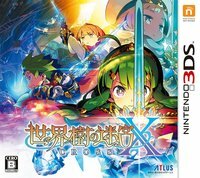 Etrian Odyssey Nexus is set to release for Nintendo 3DS on February 5 in North America and Europe.